Thanks for the great question John, I thought this answer was worth a full post. So here we go! Let’s disable the Social Connector and get rid of that pesky People Pane in Outlook 2010. 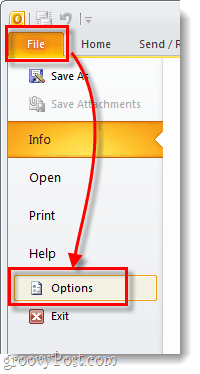 In Outlook 2010, Click the File tab and then Click Options. In the Outlook Options window, Click the Add-Ins tab and then Click the Go… button. Uncheck the box for Microsoft Outlook Social Connector and then Click OK.
Now Outlook’s people pane should be gone, as well as any social connections. Later on if you decide you want the social connector back just re-check the box from Step 3. It’s a piece of cake! But, we don’t have to stop there. If you really want to make sure that it is gone for good I’ll show you how to get rid of it for good. If you want to completely remove the Social Connector, you will need to be logged in as an administrator. Browse to C:\Program Files\Microsoft Office\Office14 then locate SOCIALCONNECTOR.DLL and SOCIALPROVIDER.DLL. All you need to do is rename the file (or if you really hate it you can delete it). I suggest you just change the file extension* from .DLL to .backup so that it is unusable; this also allows you to change it back later if ever needed. *To easily rename file extensions you’ll need to make them visible –full guide here. The extension can also be done from the file’s property window, which can be accessed by right-clicking a file and selecting Properties. It will totally disable and remove the social connector!!! I followed the instructions above but Microsoft office 2010 reinstalled the ddls when I opened it the next time . So I still get the warning messages each time I open Outlook . Thank you so much. This worked and it was so easy to do. 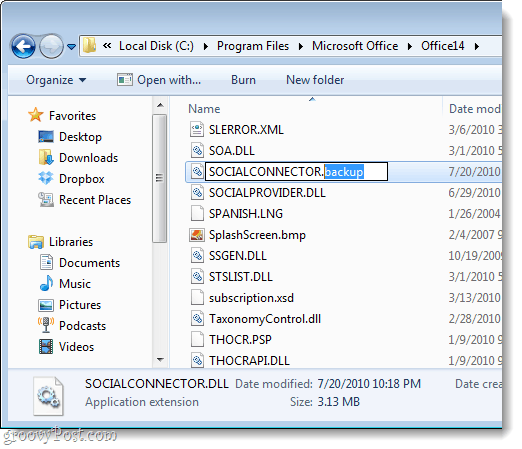 The proper way to REMOVE the social connector is to go into control panel, then add/remove programs (win xp) or programs and features (win 7). 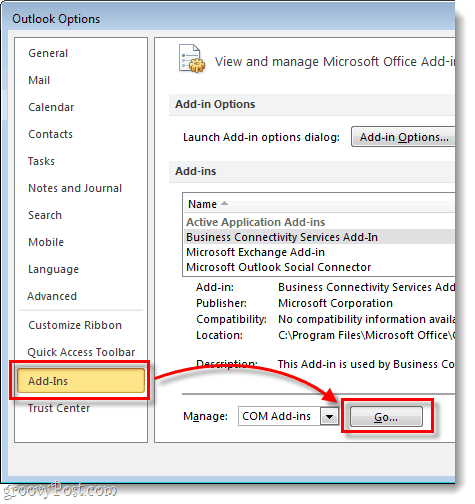 Find the MS office entry and modify the setup, unselecting the social connector add-in from the Outlook section. Helps if you have admin privs to the system you are using to do that. Thanks. It worked!!! I dont know why it started happening… perhaps from a updating software? I have been using Outlook for about 1/2 year before this started happening and then the “SocialConnector encountered an impropert argument” message came up with every email click so thanks! I still dont really know what this program is for, but from your other posts, apparently this has been going on for a while. It works …….. If you know it’s not as strange to recover it but I’m happy with this little helper. It is typically just another example of Microsoft who thinks along with us ……. and then you’ll want to take decisions where you had not counted on. I just upgraded from 2007 to 2010 and received through social media nonsense (as I look now at least still against it) in there uninvited. Temporarily stored for a while but once ……. Great article! I was just to stupid to find how to disable it! Thanks! Thank you! This is full of win. Microsoft is full of fail. My Outlook is enable the View people pane, but when i want see emails, messages, etc it says “There are not items to show in this view”. Could you help me why i cant see it? Really helpful… thanks. Nice to know I’m not alone in detesting the current obsession with social networks. HOWEVER, one of the very nice features that is bundled in with the social connector add-in is the aspect of the People Pane which in effect does an instant search and list of all emails connected with any addressees in the email you are viewing. That can be very helpful in reviewing earlier correspondence. A pity that this aspect can’t be preserved, without the constant reminder that I should add all these people to “my” social networks…. Happy to help! Welcome to groovy! The thing that’s led me to your post here is that the Social Connector adds tons of GUID entries into the IE history rendering it useless. I agree with Fred that the listing of recent e-mail correspondence is nice just wish it didn’t mess up IE History I can live with the social connection piece. Thank you; great advice & ‘to the point’! Yeah you bet! Glad it helped and thnx for the comment. If you follow these instructions can others still see your information (email & appointment titles)? Thanks very much from Germany! This was annoying me quite a while. My facebook picture and profile details still show up in other people’s outlook on my emails, even though I completely deleted the microsoft social connector?? I think Microsoft Windows Office 2010 is violating privacy by adding my business contacts out of Outlook to my private Facebook account without a warning.